So here we are with a new year and a new set. While the commons in any set are important for draft, the commons in rivals don't seem to offer much for pauper, but a few cards show some promise. So, here is a top 5 list of cards with pauper potential, but first, a look at some of he over-rated cards. So gruesome fate seems promising at first. After all, with all fo the token strategies in pauper, this could be serious reach, right? 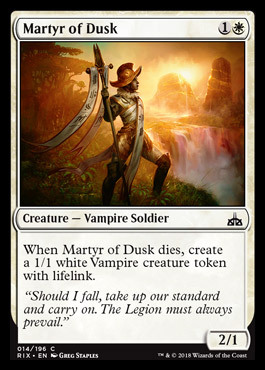 The easiest way to dismiss this, though, is that harsh sustenance is a card that is almost always better unless you are playing a tokens deck without white somehow, and that card gets little to no play, not to metion other cards to give you reach, and being black is really awkward for tokens. As for Snubhorn, people seem to think that it will be a 1-drop 3/3. If the deck that wants a 1 drop 3/3 gets to the point to trigger ascend, it's probably in a lot of trouble. I was shocked to see people making an argument for it, but in case you thought it was any good, no, it is not. Coming in at number 5 is martyr of dusk. Having 2 lives seems really good, and 2 power on the front end is relevant. While aristocrats isn't a serious deck in pauper, this is a good card to put in with doomed traveler and raise the alarm for 2 creature spells. The ability to trade with relevant creatures on the front end is decent, and it can be pestilenced to death only to leave a creature behind to keep pestilence alive, but the value already in that deck makes me skeptical of this card's potential impact. Overall, I doubt it will make decklists, but I wouldn't be suprised if it does. 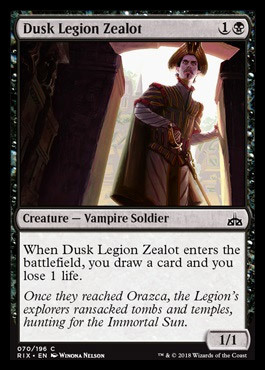 So to start us out at number 4, we have a card that is absolutely not phyrexian rager. The ability for mono black control to play creatures that give card advantage is already quite good, and I find it hard to see what you would cut for 2 CMC 1/1. The worst part is that it is a non-bo with cuamaji witches, and pauper is so full of ways to kill 1 toughness creatures that I find it hard to think it would be relevant on the field, but it is a mana symbol, so I won't write it off entirley, but I don't think it will get there. Coming in a 3 is a card that seems to be a bit less certain. 3 CMC to draw 2 is fine as a backup if muldrifter is any indication, and drawing 3 seems really good in the late game for decks like tron and evencar's justice that have a mass of lands and mana fixing artifacts. Honestly, the only thing that might kill it is the sorcery speed, but the upside of an extra card may be worth it. I think we'll see it at least briefly in some builds, even if it doesn't stick, but with the prevelance of cantrips and gush, I'm hard pressed to believe it will become a mainstay. Coming in at 2 is the first card I expect to make a difference, albeit in a tier 2 deck. Bogles has been slowly pushed out of main play, and they really needed something to make a comeback and this may be it. While it may not seem as good as other enchantments, and honestly, I still feel armadillo cloak is usually better, It has built-in resistance to edicts, wrecks aggro by increasing your ways of getting lifegain, and is costed within the 3 CMC limit in enchantments. The fact that some bogles lists try running lifelink should be evidence enought that this can fit alongside armadillo cloak, and the extra token and ease of casting makes it more tempting than gift of orzhova, and that was close to making the cut. Most of all, I hope this revives interest in pauper bogles, and I inted to play it in my lists. Coming in at 1, we have a card for another deck that has fallen from top tiers lately and needs a revival. 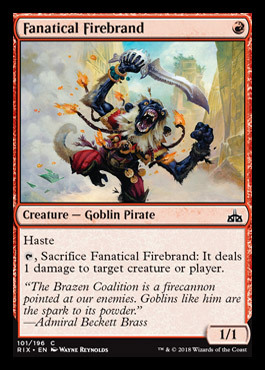 Honestly, any time a goblin costs 1, you have to evaluate it for goblins, and haste as an upside is compelling. With that being a consideration, the tap to sac ability is what I think makes it playable. While it isn't a 2/2 like other 1 drop goblin mainstays, quantity is more important in many cases, and I feel that the random sac to ping will make it work. So, what do you think of these? Did I over-rate any? Are there any I missed? Let me know in the comments, and I'll see you next time. So, you want to try pauper, and your first question is what colour? This question is based off of personal taste, but the first thing to learn is that mana-bases are much harder without a half dozen dual lands that can enter untapped or fetches outside of evolving wilds. So, what are your options? Here are the top lands in pauper. So first, we have our fixing lands, and the first and formost fixing lands in pauper are the gain-lands. So the gainlands are basically dual lands that enter tapped but give you one life. That basically all dual lands enter tapped is part of the reason pauper is played such a reasonable pace, and the incidentle lifegain matters more than you might realize, especially with the next set of fixers. Called karoo lands thanks to the original Karoo, these lands enter tapped and bounce one of your own lands, but they produce both colours of mana. 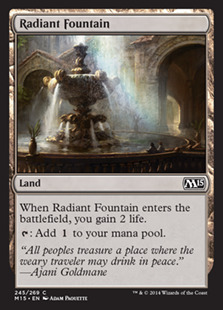 Even slower than most tap lands, this is offset by the card advantage of having 2 lands act as 3 as well as ramp potential for land untappers like voyaging satyr, and the bounce can be offset by using the mana before you bounce your land and then getting utility off of the land re-entering the battefield through lifegain or other effects. Be aware that too many of these can result in an opening hand that cannot be played courtesy of having only these lands which have no use without another land to bounce. Overall, be ok with a much slower deck that intends to use cards efficiently rather than quickly. Almost strictly worse than the gainlands, essentially they can be copies 5-8. Sometimes the gate subtype can matter, mostly for searching effects as gatekreeper vine is a decent card for some decks, but mostly, don't play these unless you need to. Onto search lands. Ash Barrens is probably the best of the searchlands because it can enter untapped for mana when you need it and fixes your mana to any type with any other land when you need another colour. The added bonus of being able to thin out your deck and getting a card in your bin is not irrelevant, either. A staple card in limited that sees fringe play in standard, when you need more than two colours, this card gets you any one of them you need, and has a copy 5-8 with terramorphic expanse which is a functional reprint of this classic. Aside from fixing, you may put it into your deck because it thins out your deck or put a land in your bin for delving, or you can use it in a landfall deck to have a two trigger land. Not every deck wants this as it has the same slowness as the duals, but for some decks, this is exactley what they need. Probably the most infamous land cycle ever printed, having all three out at once let's you create seven mana for three lands. With expedition map legal as well as a large number of ways to search the top x cards of your library, this comes out often, and getting this much mana this early is insane enough that there are entire decks based around it. Unlike the other lands on this list, though, you won't be sticking these in non-tron decks, so worry more about stoneraining these than playing them. These lands all ente tapped, but they produce standard colours and effects that can make the mana slowing worthwhile. Bojuka Bog is easily the most playable, as hating out graveyards is very powerful in a format with flashback allstars like Chainer's Edict and delve creatures like Gurmag Angler. Halimar Depths is cute, but often frustrating unless you have a way to shuffle your library as rearranging three lands doesn't help you draw what you need. 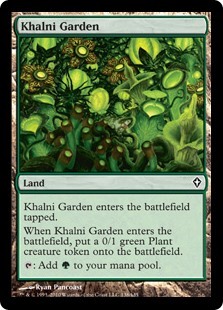 Khalni Garden looks out of place at first, but its power comes in creating tokens to either slow aggro decks down or proving sac targets for saving your big creatures from edicts. In all these cases, the cost is generally minimal enough to allow for the effect. Artifacts lands are a thing because affinity is a thing. For those who do not know, affinity is a mechanic that makes cards cheaper for each artifact you control. Add to this metalcraft and artifact sac cards, and these lands, which enter untapped and work for coloured mana, become staples in any artifact matters decks. Do be aware that these are hit by artifact destruction, so don't forget darksteel citadel as an indstructable variant. Cycling lands are a quintessential low cost land that allows you to use them for mana early on and then cycle them for the cars you need late game. Coming into play tapped means you don't want them in every deck, but when you run a high land cou nt, these become great ways to control your curve. Whew.... that was alot. Don't worry, I intend to shorten these in the future, but lands are the foundation of your deck, and also one of the biggest differences between pauper and other formats in selection. So, thanks for reading, and I'll talk to you later. Hey, and welcome to Pauper Life, our new blog on all things Pauper. So, your first question may be, what is pauper? 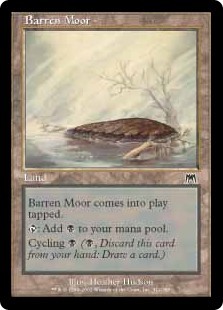 Pauper is a format for Magic: the Gathering in which only cards printed at common rarity are legal. Now, if you don't know what Magic is, go check out soe articles and come back, because it's far too complicated to explain in this overview, but for those who play, pauper starts as a budget format. With the most expensive decks at just under $100, and most running $20-$40, it is a low commitment format to enter with cards that never diminish in value like standard. Once you enter, though, you find a very competitive format where brewing is only limited to your ability to find 20+ year old commons. So first, let's dispel a myth. Pauper is not a weak format. With several decks that mirror legacy decks such as burn and mono-blue delver, you quickly find that Wizards has printed a lot of their best cards at common, from counterspell to the best cantrips and deck control in all of magic. So why play pauper? First off, you can build a dozen decks in pauper (including every tier 1 deck) for less than a single tier 1 modern deck. Second, you can switch between deck easily to find what you like. Every archetype is viable in pauper, and the current meta is very forgiving for homebrews. The lack of hard wraths and degenerate combos means you can play any speed deck you want, and everything from burn and goblins through hard control and turbo-fog has had a chance to shine. Also, as an eternal format, it is a brewer's dream. Their are several infinite combos and underrepresented tribes in pauper that have potential. With such low cost to build a deck, their is a lot less pressure for your deck to be perfect out the gate. One or Two tickets online lets you build most home-brews, so feel free to build a deck just to try it, and if it doesn't work, just take your losses and try again. Finally, it is a format where lifegain is prevenlent, making long games more possible and boardbuilding is much more rewarded. If you hate trying to play midrange, build a complex board state, and then get it all thrown away by a single control card or die randomly to storm or craterhoof, then give pauper a try. Control card, combos, and way more (conditional) wraths than most people realize exist, but they have much more rational limitations and power. So, that's the basic, and I hope you'll keep reading to try out a healthy format where anything is possible, and you don't have to take a mortgage out on your house to play.